Whoopie pies are a classic treat here in Lancaster County. Authentic ones are delicious, typically chocolate with a cloud-like white filling. For those of you who have never had one, the sandwich cookie part is basically like eating cake, soft and fluffy, while the filling is sweet and puffy, sort of like a marshmallow cloud. If done wrong they are bad: dense, dry and tasteless. 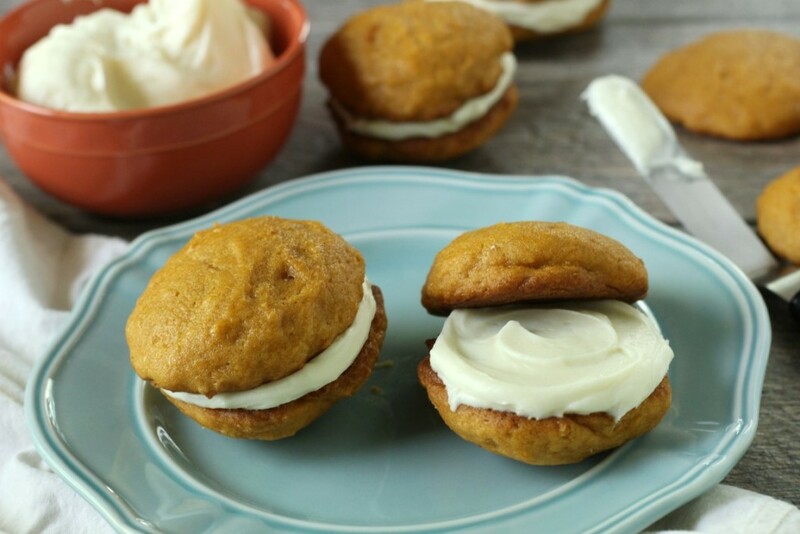 I’m not sure whether it’s baking cake batter on a flat cookie sheet (whoopie pie molds are for cheaters) or using raw eggs whites and shorting in the filling that is intimidating, but I’ve never actually tried to make traditional whoopie pies. Pumpkin gives everything it touches a soft, cake-like texture, including these pumpkin cookies. 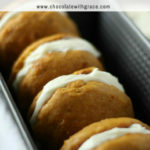 After making them, I thought how perfect they would be for pumpkin whoopie pies. 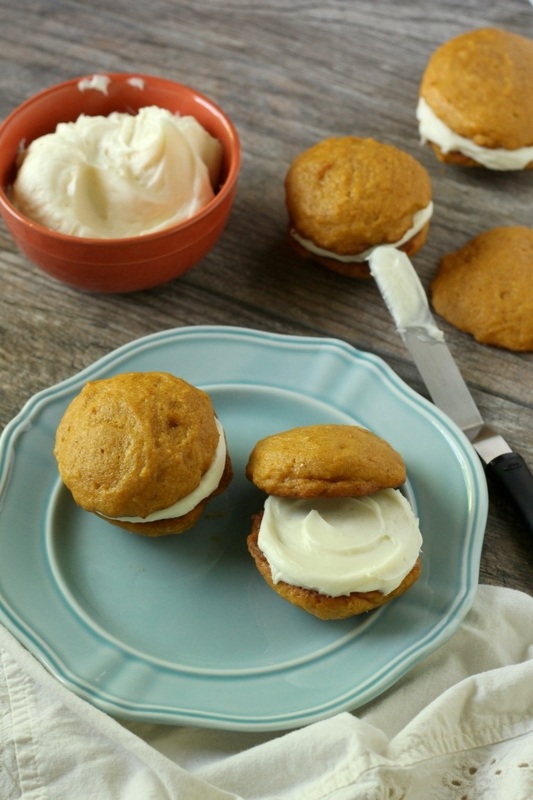 I wasn’t brave enough to try the traditional filling, but I love cream cheese paired with pumpkin, so I whipped up a quick cream cheese frosting to go between them. 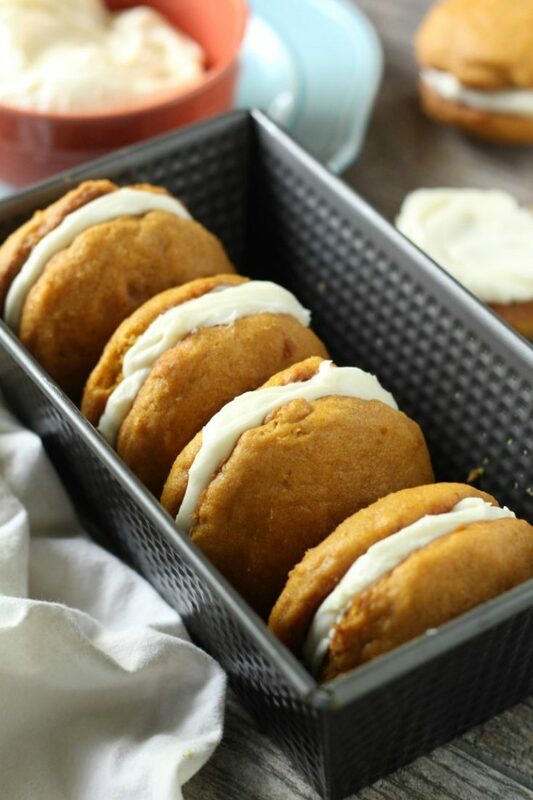 While they’re definitely not traditional with their cream cheese filling, these pumpkin whoopie pies are a perfect fall treat for those of us who crave pumpkin. 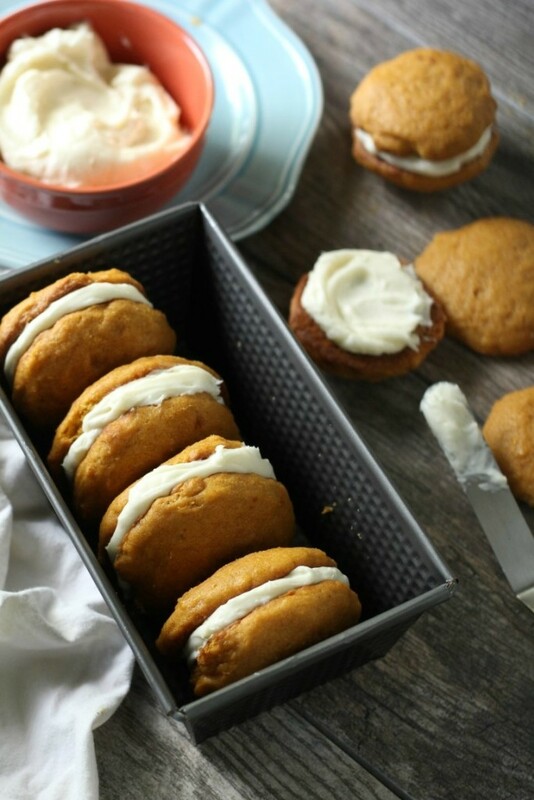 The cookie is soft and the cream cheese filling is a perfect pairing to the pumpkin. 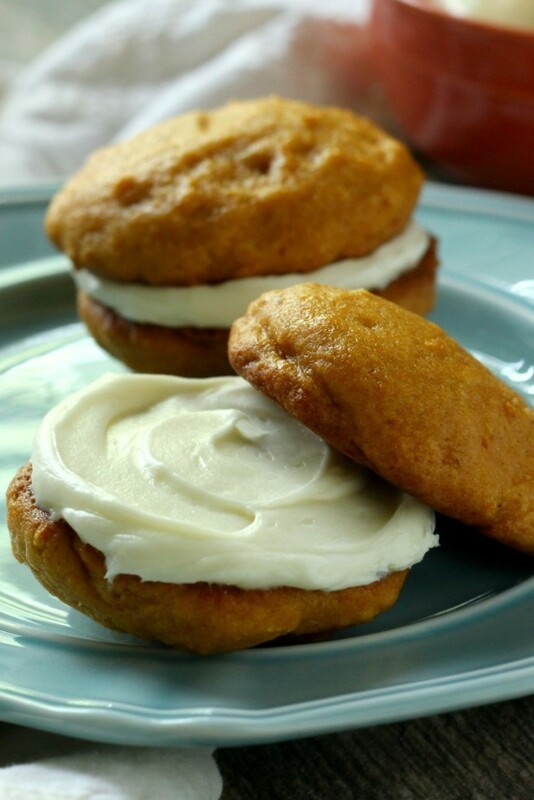 Thick, soft pumpkin cookies filled with tangy cream cheese frosting. In a large bowl, beat together butter and sugars until well creamed. Beat in eggs, pumpkin and vanilla. In a separate bowl, mix together the flour, baking powder, baking soda, cinnamon and salt. Add dry ingredients to the wet and stir until combined. Preheat oven to 350 F. Drop dough by rounded tablespoons onto cookie sheets. Bake for 13-14 minutes or until edges are slightly browned. Do not over bake. Let cool completely. To make the filling, beat the butter and cream cheese with a mixer until light and fluffy. Beat in the vanilla and salt and powdered sugar until smooth. 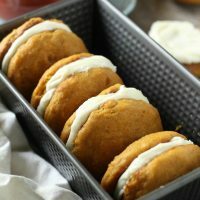 When I’m brave enough to tackle a traditional chocolate whoopie pie, I’m going to use this recipe from Floating Kitchen. This chocolate salted caramel version from Sally’s Baking Addiction also looks delicious! 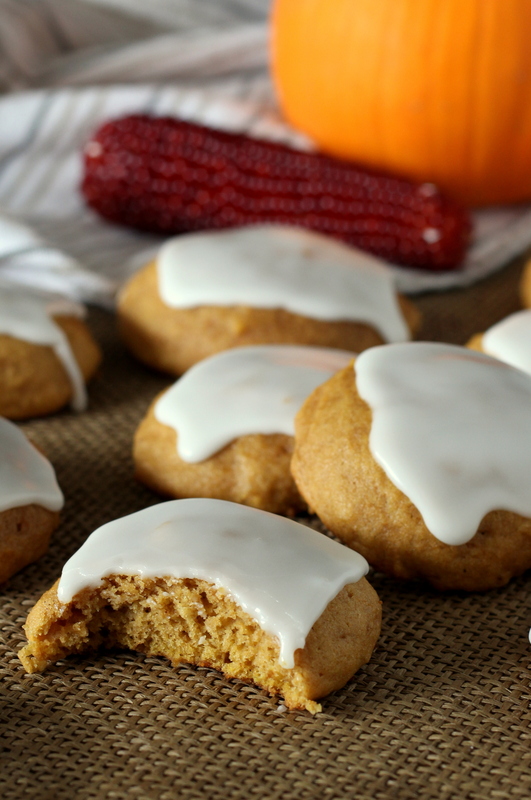 If you’re looking for a simple pumpkin recipe, try my famous, soft glazed pumpkin cookies. Great job Mallory! These are delicious! Can these be put in the freezer after they are made? Using a cookie dough scoop makes it easy. Hi, can I make these a day ahead and they still be soft enough? They sound amazing! Hi, my filling looks more like icing than frosting like it looks in your picture. Any idea why? Thans! It could need more powdered sugar. Or your butter was slightly melted, or too much milk.